At BrandMatters, a common source of confusion for clients is what to include in the brief for a new corporate identity. Clients usually have a clear brief for logo design work, whether it be a brand new logo or a refresh of an existing logo – but when it comes to briefing the identity, the detail becomes more vague. A logo is the consistent, core external visual representation of your brand. A logo encapsulates the essence of an organisation in its simplest form, via the use of a mark or icon. According to Paul Rand, famed American art director, a logo is ‘a flag, a signature, an escutcheon, a street sign. A logo does not sell (directly), it identifies’. A well-designed logo will help communicate the intent of your brand simply and distinctively. Yet the logo itself is only one aspect of a company’s commercial brand. It’s a visual identifier and it enables the brand to stand out and be distinguished from other competitors, but on its own it is just the tip of the corporate identity iceberg. Its role is to reflect the broader values and messages of the organisation– but it can’t do this alone. Effective logos are supported by a comprehensive corporate brand identity. A brand identity, also known as a look and feel, generally includes elements such as fonts, colour palettes (primary and secondary), secondary design devices, an image and photographic style and more. It is this toolkit, or suite of elements, that truly ensures the consistent representation of an organisation’s brand with every execution. If you have a strong corporate identity, your brand will be immediately recognisable even if you place your hand over the logo. 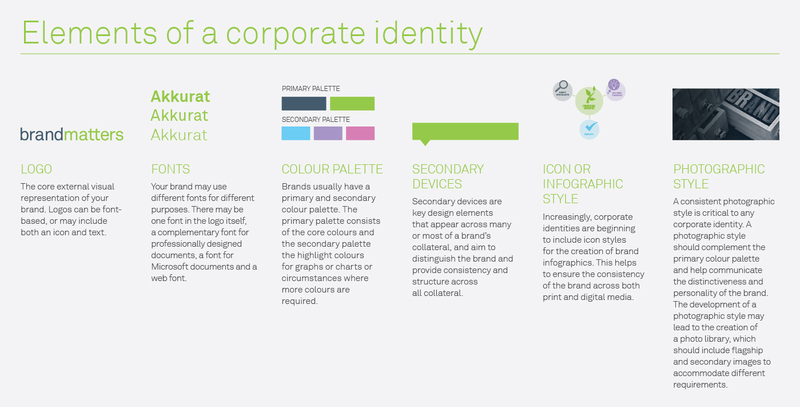 BrandMatters has developed The Guide to Brand Identity to explain the important link between brand identity and brand positioning, and to provide senior marketers with a tool kit to help you develop a consistent visual identity for your brand. Download the Guide now.